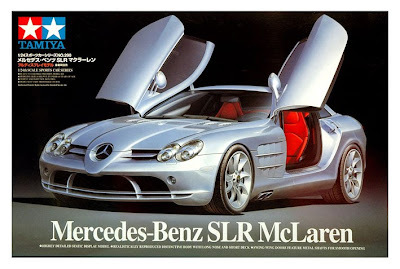 There are several competitors in the ‘200-mph-plus’ street-legal road car market, and the Mercedes-Benz SLR McLaren is one of them, with a top speed of 334 km/h (208 mph). Using Mercedes' expertise in racing, and harking back to the classic M-B 300 SLR racer and 300 SL ‘Gullwing’ coupe of the mid-1950s, the SLR has been a joint venture with Formula One teammate McLaren, which built the car in the UK from 2003-2009. 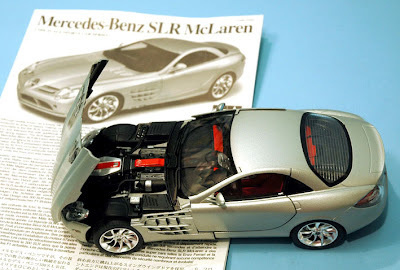 Tamiya produced this 1:24 scale kit of the SLR in 2006, as an addition to its ever-growing Sports Car Series, and the 195 mm (7.7 in) long kit is still available (top picture). It is moulded in silver and black plastic, colours that echo one of the real SLR’s available schemes, though adding red to the model’s cabin lends a splash of colour (see picture) and helps mimic the original Gullwing, which often sported a red interior. The kit also features a Tamiya innovation of recent years - a metal underbody pan that adds weight and heft to the completed model. One complaint with plastic cars kits is that they always seem ‘too light’, though as they are static models, I’ve never quite been sure how relevant this is. However, the use of this metal underbody pan does help, even if it is purely picking up the model to admire it! 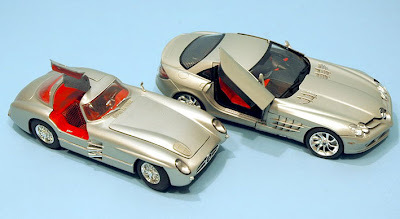 The bottom pic shows the Revell 300 SL model (left), showing one of its doors open. The Tamiya SLR (right) displays a door opening not only upwards, but forward as well. The comparison also shows, as both models are to the same 1:24 scale, the increase in size of the newer car over its forebear. The SLR is available from Amazon here. 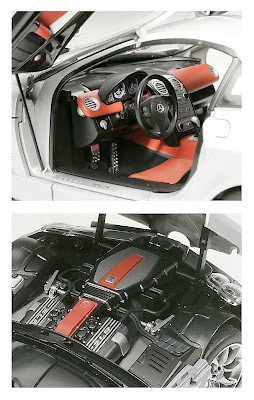 Model interior pictures, courtesy Tamiya.